At this year’s Bethesda E3 conference we got another glimpse at the highly anticipated Elder Scrolls: Skyrim for Nintendo Switch. Though many thought this may be a straight port of the 2011 game for Nintendo’s new hybrid console, it looks like Bethesda and Nintendo have worked together to do something slightly different with the game. In a short trailer, we got a look at how Skyrim on Nintendo Switch will take advantage of some of the Switch's more individual features such as allowing players to the Jon-Con’s motion controls to control their weapons. 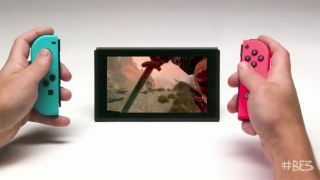 Whether you prefer to use a sword and shield or a bow and arrow, you’ll be able to hold each Joy-Con separately and use triggers and movement to perform various actions. The trailer also showed that the game will also support Amiibo use. By tapping a Link Amiibo onto the reader on the console's joystick, the player was able to bring Link’s Master Sword, clothes and weapons into the game world to use for themselves. This is definitely a way to add a Nintendo edge to the world of Skyrim, though it’s not clear whether or not you’ll be able to use Amiibo other than Link and bring even more different Nintendo character items into the game. Mario fighting a dragon? Now that’s something we’d love to see. There’s still no solid release date just yet, but we know the game will be released in Fall this year. Perhaps a more solid release date is something we'll see announced by Nintendo itself later this week during its own E3 livestream.